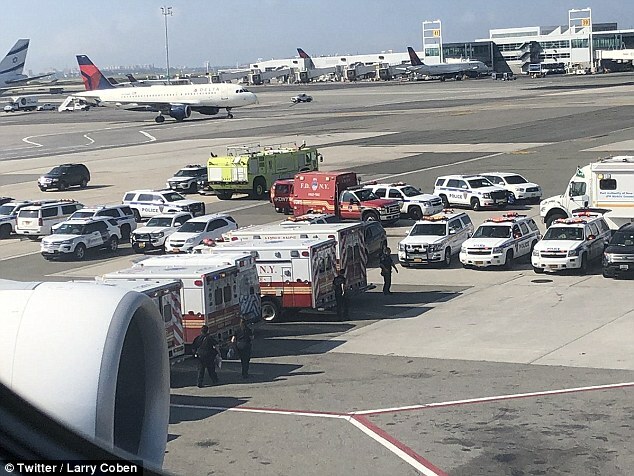 Emirates airline has claimed that ten passengers have been removed from a quarantined flight at the John F. Kennedy International Airport despite numerous reports of 100 passengers falling ill. 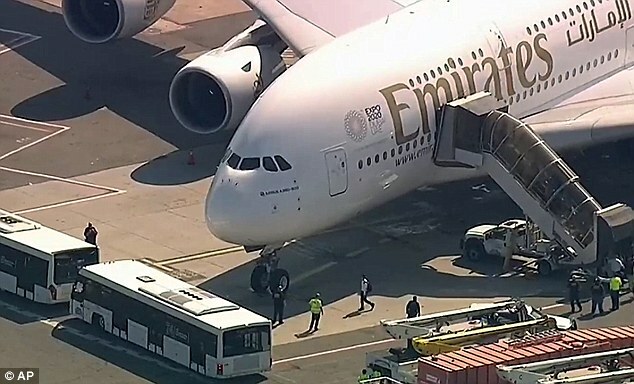 The double decker A380 aircraft, which was traveling from Dubai to New York City, landed at the Queens airport Wednesday morning shortly after 9am. Initial reports said up to 100 passengers fell ill, but a statement from Emirates put that number at just 10. 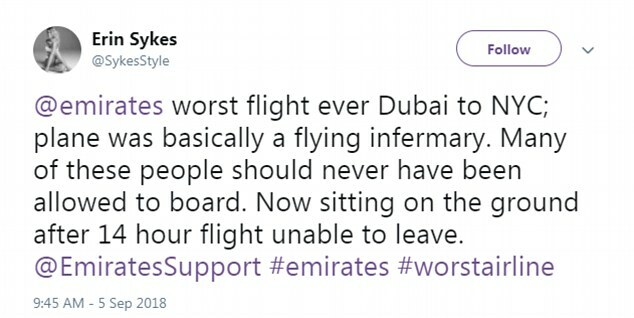 The statement was shared by Emirates on Twitter claimed that only 10 people had been treated. 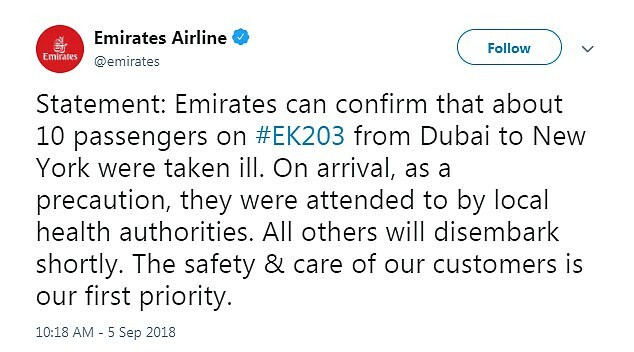 'Emirates can confirm that about 10 passengers on #EK203 from Dubai to New York were taken ill,' the statement read. 'On arrival, as a precaution, they were attended to by local health authorities. All others will disembark shortly. 'The safety & care of our customers is our first priority,' the airline wrote. A DailyMail.com request for comment to Emirates was not immediately returned to clarify that discrepancy. A spokesman for Mayor Bill de Blasio also said 10 people were hospitalized and another eight were treated at the airport. 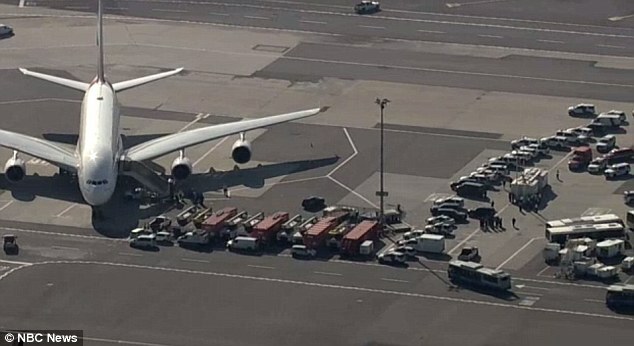 Airport officials said Emirates Flight 203 was carrying 500 passengers when some of them reported feeling sick. The pilot raised concerns to air traffic controllers that many of his passengers appeared to be sick with fevers over 100 degrees Fahrenheit and several of them were coughing. Video from news helicopters showed the jet sitting on the tarmac surrounded by ambulances, vehicles and airport personnel. Photos showed officials from the Port Authority Police and the Centers for Disease Control and Prevention waiting in a staging area to check passengers after they landed. Passengers were exiting the plane with their luggage and getting on to buses. Some even shared photos from inside the plane as they prepared to disembark. A few passengers also tweeted about the flight. 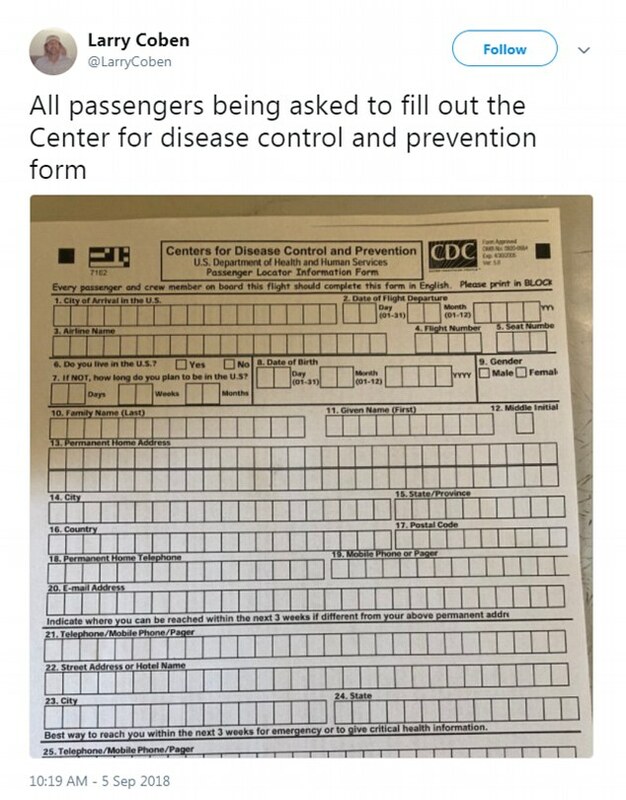 Larry Coben, who said he was on board the aircraft, wrote on Twitter that passengers are being asked to fill out a Centers for Disease Control and Prevention form and that CDC personnel had boarded the aircraft. 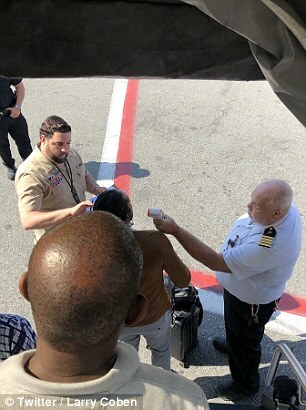 He also shared photos of passengers getting their temperatures taken. 'Deplaning and having temperature taken,' Coben tweeted. 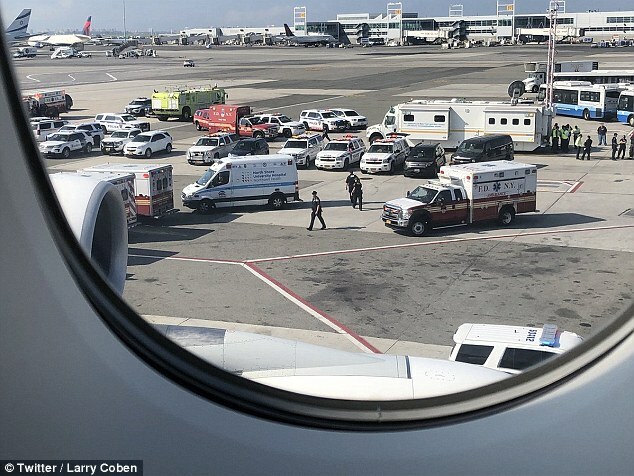 Some sick passengers were taken to Jamaica Hospital Medical Center with non-life-threatening conditions, according to a New York City Fire Department spokesman. CDC public health officers were working with other agencies to evaluate passengers, including taking temperatures and making arrangements for transport to hospitals, spokesman Benjamin Haynes said in the statement. Passengers who were not ill were allowed to continue with their travel plans, Haynes added. 'Many of these people should never have been allowed to board. Now sitting on the ground after 14 hour flight unable to leave. @EmiratesSupport #emirates #worstairline,' the woman added. 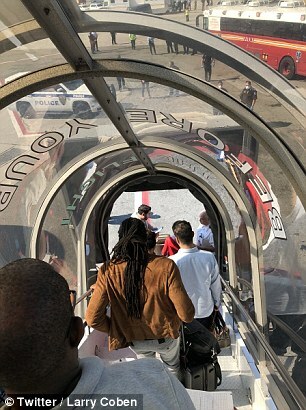 In an interview, Sykes said she saw a few passengers being taken off the plane first for medical attention, but she added that 'many, many' others were showing signs of illness. 'Very intense coughing. Violently sick. Going into the bathroom a lot,' she said when asked to describe the scene. Passenger, Raghida Dergham, who was sitting in the business section of the aircraft said in an interview that sick passengers were in a 'lower level' economy section of the plane. But others said they suspected that some passengers were sick before they got on the plane and that the airline should have done more to protect others. 'Why did they allow them on the flight? ... I sat with them for 13 hours. If it's a virus, we're all getting sick,' Srinivasa Rao said. It's unclear what caused the high fevers and coughing, and health officials are still investigating. But fears abound that the sickened passengers could have contracted MERS - Middle East Respiratory Syndrome - which Saudi Arabia has been battling to control since 2012. MERS has been singled out by global health authorities as the most concerning virus at the moment because it is notoriously resistant to antibiotics. Laurie Garrett, author of The Coming Plague and Ebola: Story Of An Outbreak, told the DailyMail.com that it is unlikely, based on the symptoms reported so far. CDC officials say cases involve fever, coughing, and flu-like symptoms. According to Garrett, the biggest concern for medics to look out for is respiratory symptoms. It is also unlikely that MERS would strike so many so quickly, says Amesh Adalja, MD. He said it would be 'odd to have so many probably random people becoming unwell at the same time from an infection'. The aircraft was taken to a location away from the terminal so that emergency officials could evaluate the situation, officials from the Port Authority of New York and New Jersey said in a statement. White House spokeswoman Sarah Sanders said they were monitoring the situation and President Donald Trump was being updated as new information became available.